Marketing has evolved beyond the ‘batch and blast’ approach. Yet many marketers still struggle to apply this strategy to social media and scheduling meetings at events. Companies have resigned themselves to simply posting on social for attendees to visit their booth or arrange a meeting. Yes, this boosts visibility…marginally. But why bank your sizable event budget on the hope that followers actually follow-through? With 83% of B2B marketers heavily invested in events, it’s time we start using social media to its fullest potential. With precision and personalization fashioned into your event marketing on social media, you’ll secure more meetings—and more handshakes. Today, we’ll discuss five social media tactics that work to schedule more meetings at events. There are dozens of social media tools to track hashtags like Keyhole or Sprout Social. Many marketers use these tools to monitor their brand mentions, stay in the know on relevant hashtags, and even track event-based hashtags. However, there is one small trick to get more out of these tools, especially when it comes to event-based hashtags. There is usually an official event tag promoted by the event itself. For example, the Consumer Electronics Show’s official 2018 hashtag is #CES2018. 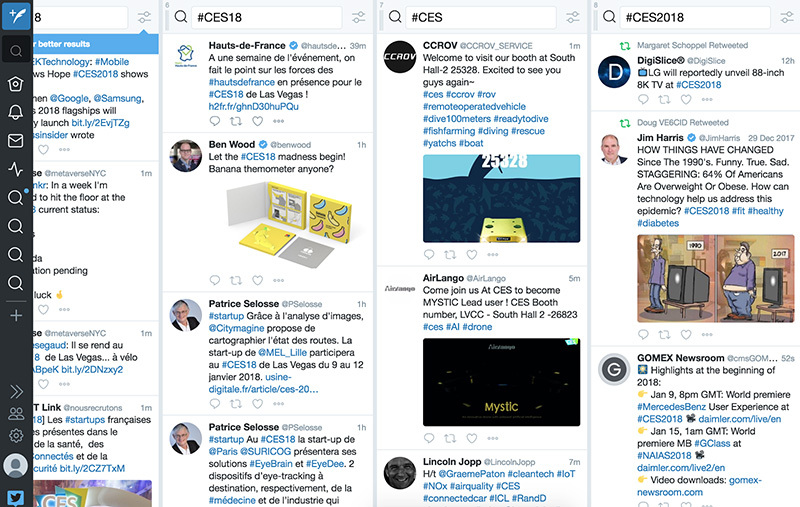 However, thousands of folks are using similar versions of the hashtag including #CES and #CES18. If you do this within Tweetdeck, you can easily follow and add folks to a Twitter list to then reach out personally and schedule a meeting. Not everyone uses Twitter, so be thorough and plug the event hashtags into Facebook and Instagram as well. These platforms are also ideal for finding, researching, and reaching people before and during the event. One great advantage of Instagram is the ability to direct message anyone on the platform. Marketers can stand out from the crowd and send a meeting invite through social media versus email. 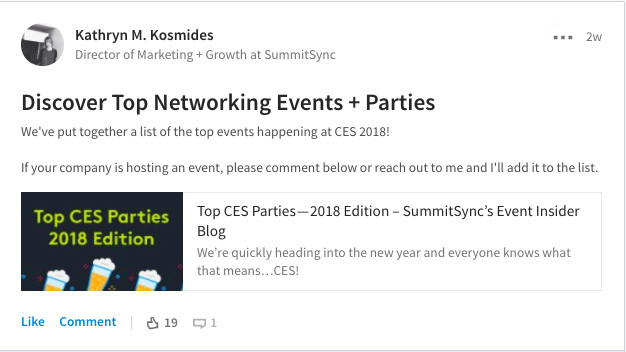 Joining Facebook and LinkedIn groups lets you connect with a cache of prospects you know are attending the event. The best way to really connect with other group members is by sharing great, relevant content. Whether the group is crowdsourced or sponsored by the event organizer, whole teams and their decision makers are often represented. You can peruse the member’s list as well as the likes and comments—then reach out to schedule a meeting at the event. Less inundated social platforms provide ample opportunities to schedule meetings at events. Marketers can use Quora to answer questions around the event and demonstrate thought leadership relatively easily. To find recent and relevant questions in Quora, search a certain term (like “CES”) and then scroll down below to ensure you select “by time” and choose within the last month. This ensures you’re only seeing recent questions that are still in need of answers. Reddit is another less noisy social platform where you can post relevant links and engage with fellow Redditors. Instead of posting as your brand, have individual team members actively engage with their Reddit communities and share relevant content. Beware of spammy tactics, as both platforms are sensitive to branded activity and don’t hesitate to eject transgressors. Commenting on event-related content is a great way to engage with brands you want to meet with at the event. Take the time to craft a thoughtful comment that adds value. By initiating a rapport, you appear attentive and differentiate yourself from the rest. Any prior engagement will elevate your chances of arranging a sit-down during the busy event. After writing your comment, share on social and be sure to tag the company so they see it. You can also follow up via email to ensure you land that meeting. With many companies already using social media to schedule more meetings at events, we hope these five tactics set you apart from the crowd and garner meetings with new prospects. If you’re looking to discover who you should be meeting with at every event without having to spend hours perusing social media for possible leads, our meeting automation platform can help your team gain instant clarity into who you should be meeting with at every event.